Disney World is often my go-to vacation destination, but I recently ventured out of my comfort zone and embarked on a Disney Cruise. I wanted to try something a little different, but I always love having that Disney magic, and that’s exactly what I got on this vacation. We sailed out of San Juan, Puerto Rico on the Disney Wonder. Our itinerary was a Southern Caribbean cruise, so we got to stop at some pretty exotic locations that I would otherwise never get to visit. I’ll talk more about the places we stopped at later on. Disney World and Disney Cruise are two totally different experiences. While you still get the Disney magic and touches on the cruise, the pace is a lot slower. Of course, you can still pack your day with activities, but you can also sit back, relax and still have a great Disney time! Let’s go through the important points that you need to consider when looking at a Disney Cruise. We sailed on the Disney Wonder, which is one of their smaller ships. 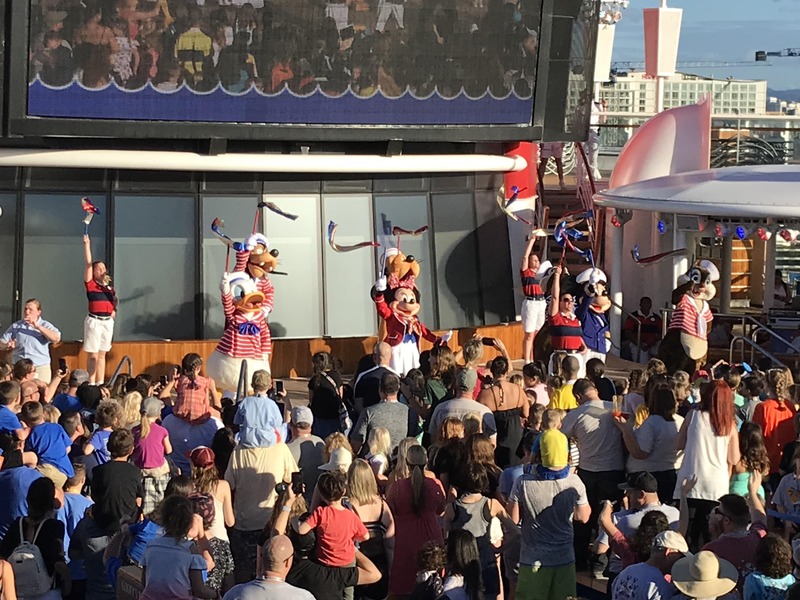 The Disney Magic and Wonder hold approximately 2400 passengers, while the Disney Dream and Fantasy hold approximately 4000 passengers. I really liked the size of the ship. While it is still quite large, it is just the right size for getting around. It never felt like we had to walk very far to get anywhere, even when we walked from one end to the other. The interior is beautifully decorated and the main atrium is themed after Ariel from the Little Mermaid. 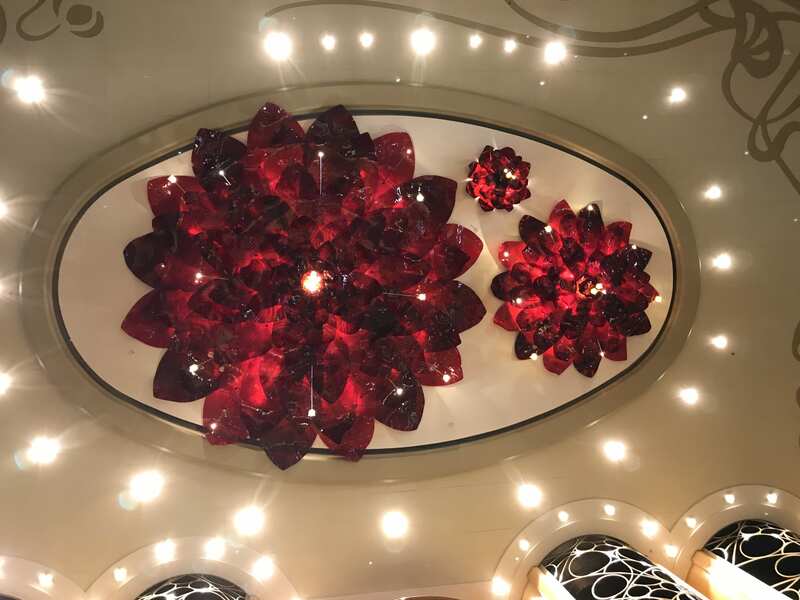 If you look way up in the atrium, you’ll find Ariel’s flowers that she wears in her hair on the ceiling, which gives a nice touch to the décor. The exterior is themed after the classic type ships, such as the Queen Mary. I find anytime we stopped on port, our ship just looked absolutely beautiful next to other ships. Nothing beats the look of the Disney ships. I also noticed that the maintenance on the exterior was well-maintained. We were stopped next to other cruise lines at port and I couldn’t help but notice how much rust was on some of the other ships. You’ll never see that on a Disney ship! There are 4 types of staterooms – inside, ocean view, verandah, and concierge. We were in a deluxe ocean view family stateroom. It slept 4, but they do have rooms that sleep up to 5 guests. Our room had a queen bed, a day bed, and a bunk bed that pulled out of the ceiling above the day bed. The day bed and bunk bed are large enough to fit an adult that is under 6 feet tall. 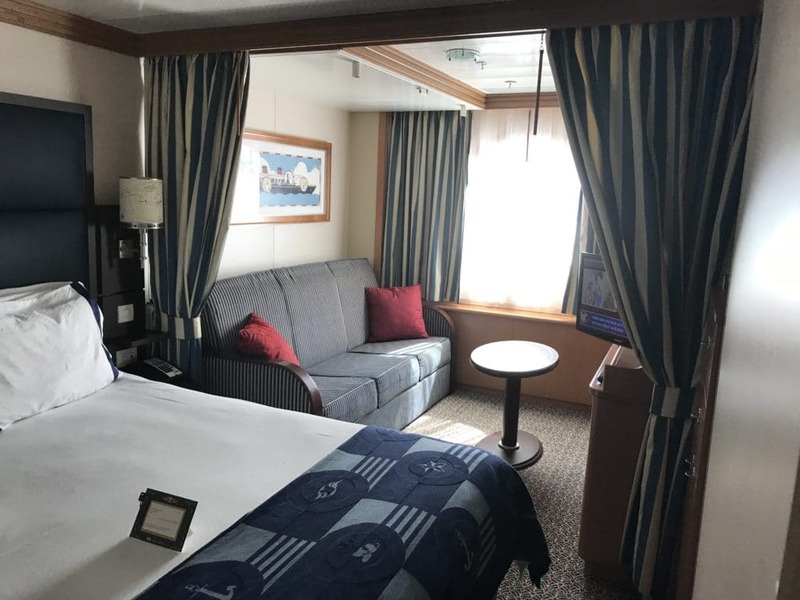 The room is quite spacious for a cruise stateroom, and we were quite surprised at how much storage we had. We were able to completely unpack 4 suitcases and still have tons of empty drawers left for storage. There is also a large closet where you can hang clothing. In the closet is a safe that is large enough to fit a 13” laptop and a few other small items. One thing that Disney does differently in their staterooms is that they have double bathrooms. I absolutely love this feature because then it makes getting ready in the morning a lot easier for families. One bathroom has a sink and toilet, while the other has a sink and the tub/shower. I find this design just genius, Disney really does think of everything! Mom or dad can be in the shower while the teens are brushing their teeth or doing their makeup in the other bathroom. Your stateroom attendant will be in your room twice per day. In the morning, they will come and clean/make up the room for the day. In the evening, while you are at dinner, they will come back and turndown your room for the evening. If you are using the day bed/bunk beds, then this is when they will set them up for you for the evening. 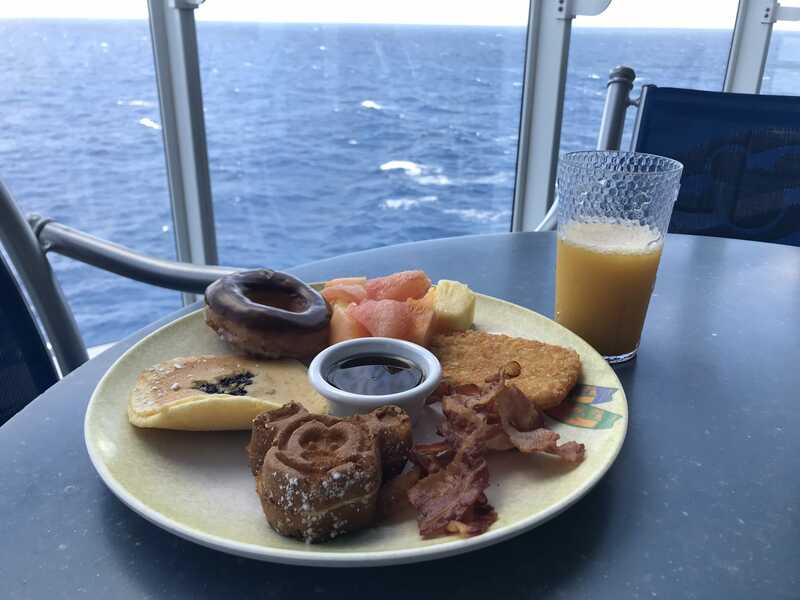 All food is included with a Disney Cruise vacation, and it truly is one of the best parts. 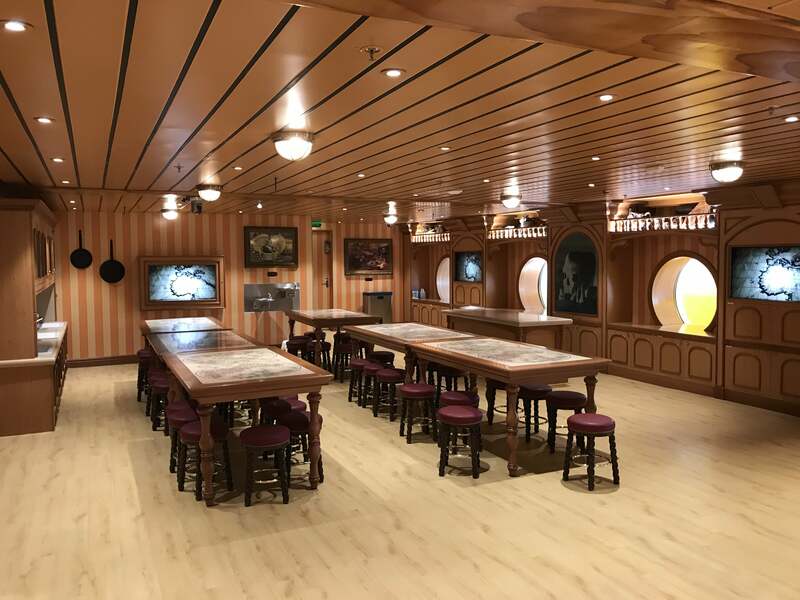 The Disney Wonder has 3 restaurants and a buffet. There are also some smaller counter service restaurants at the pool area where you can get sandwiches, pizzas, shawarma etc. The 3 restaurants that are on the Wonder are Tiana’s Place, Triton’s and Animator’s Palate. They have two seating times for dinner – 5:45 PM and 8:15 PM. We were originally placed in the 8:15 PM time slot, but put our name on a wait list for the earlier dining and got it 2 weeks before our sailing. Disney has rotational dining, which means that you rotate throughout the various restaurants each night and your serving team follows you. This is where Disney really excels, and the service is world-class. Disney invests a lot to make sure they have the best serving team, and they sure do deliver! Since you have the same serving team every night, they get to know you and it makes it a much more personal experience. By the second night, your servers will already know what drinks you like and have them coming before you even ask. Also, you can order anything on the menu, it’s all included! Can’t decide between two dishes? Then order them both! Everything is included when it comes to food, so order as much as you like. Alcohol is an extra, so you will want to keep that in mind if you’d like some drinks with dinner. We ordered a wine package prior to the cruise, so we had bottles of wine available at dinner. Ordering the wine packages in advance will save you about 25% as opposed to just ordering wine onboard. If you don’t feel like eating in one of the restaurants in the evening, then you also have the option to go to Cabanas, their buffet restaurant. This area is open for breakfast, lunch, and dinner. One of our favourite parts of the cruise – unlimited soft-serve ice cream! 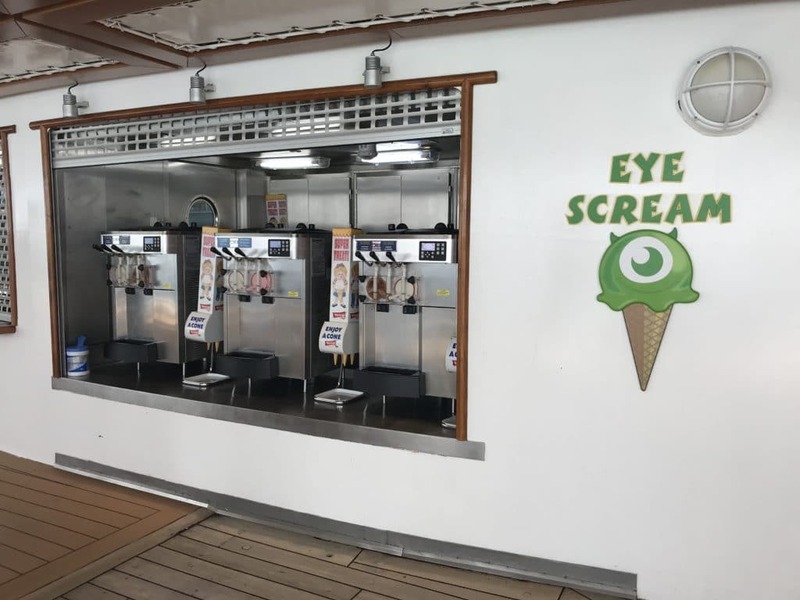 They have an ice cream station called “Eye Scream” by the main pool on deck 9 and you can just help yourself to as much as you’d like. I think we averaged about 3 cones each per day, we just couldn’t get enough! They have your standard chocolate and vanilla flavors, but they also have one machine that they change daily with different fruity flavors. Another important thing to mention is that room service is included with your cruise. You can order it 24 hours a day, as much as you’d like, it is all included! The entertainment is very similar to what you would get at any other Disney location. I really appreciated this since it really gives you that Disney feeling. They have activities going on throughout the day, but the evening shows and deck parties are where the action is at. Every evening, they have a show in their theatre. The show runs twice so that guests from each dinner seating can view it. If you have the early seating, then you’ll watch the shows after dinner, but if you have the late seating, then you’ll see the shows before dinner. The shows range from magic shows, musical entertainment, to broadway style Disney musical shows. We really enjoyed the ones we saw onboard and definitely recommend you check them out if you are on a Disney Cruise. There are also deck parties while onboard. We had 2 on our sailing – our sail-away party and the pirate party. Both are super fun with lots of energy. 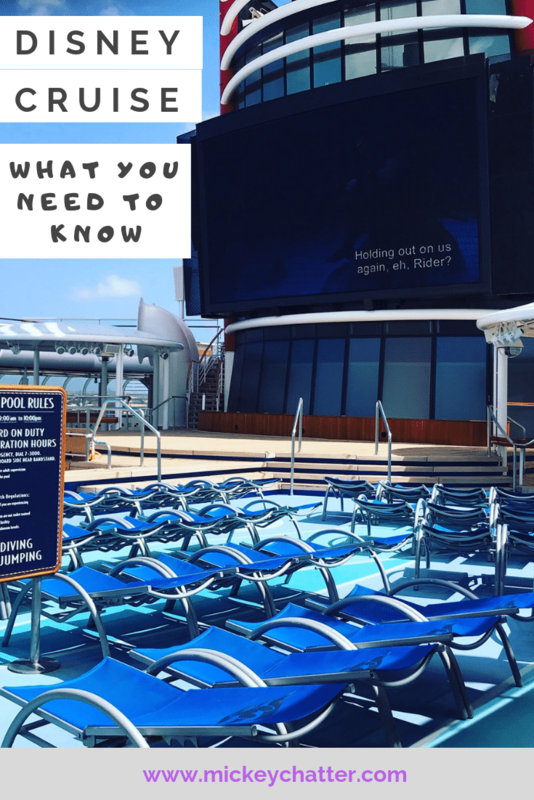 They take place on the main pool deck and you’ll get the best view from up on deck 10 overlooking the pool area. For the pirate party, you will even get to view a fireworks show over the ocean. I think Disney is the only cruise line that shoots fireworks from their ship, and I think that is pretty special! They also play movies onboard daily. You’ll have the chance to watch all kinds of movies, but what is really special is that they also play what is currently in theatres. We were able to watch Mary Poppins Returns on our sailing. If you are worried that your kids won’t get to meet all their favourite characters, you’ll have nothing to worry about! There are a TON of characters to meet on a Disney Cruise ship. They have schedules set all day long. You can look up the schedules on the Disney Cruise app or on the navigator sheet they leave in your room every day. It will tell you who is meeting where and you just show up. The characters are usually there for about 15 minutes at a time, so you’ll want to line up a few minutes before they are set to show up. For the princesses and Frozen characters, you’ll need to book those time slots on advance. You can do it as soon as your 75 day online check-in opens up, or when you get onboard at guest services. We were not able to get any time slots for the Princess Gathering online, but easily got a spot on embarkation day when we got on the boat. 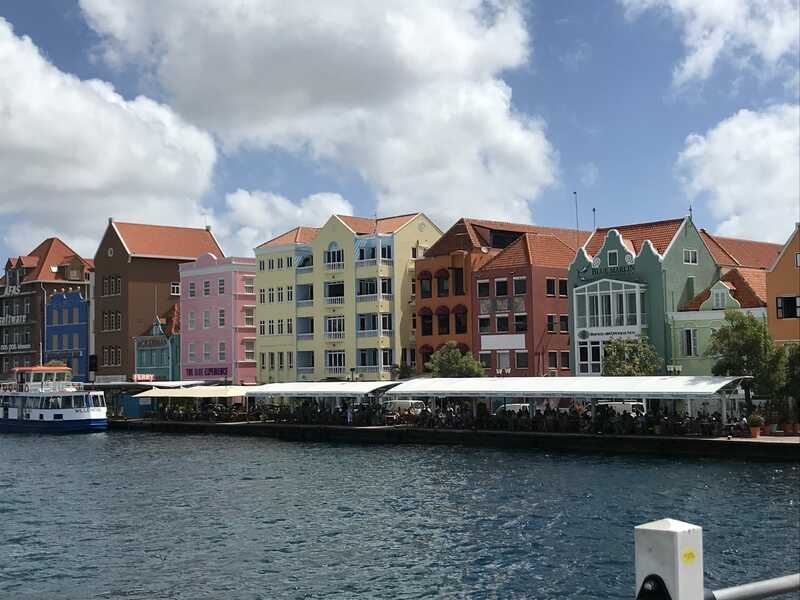 For our sailing, we stopped in the islands of Tortola, St.Kitts, Curacao and Aruba. Although I was bummed that our sailing did not include Disney’s private island, Castaway Cay, I was pretty happy with the islands we were stopping at. I would never visit these islands otherwise, so getting to see them on a cruise stop was spectacular. You can book excursions ahead of time with Disney. I find they can be pretty expensive, but you have the security that it was arranged with Disney and you will definitely get back to the ship on time for sail away. If you don’t want to pay extra for the Disney excursions, you can still venture out on your own. When you get off the ship, there is usually a port area where you can walk around and do some shopping. At the port, you will also find tons of taxis and tour companies offering tours at a much lower cost. We did a $20 tour in St-.Kitts that took us around the island to see the views. We got to go to a lookout point where you can see both the Atlantic and Caribbean Sea, the views were pretty spectacular! All of the kid’s clubs are included at no extra cost, with the exception of the nursery. The nursery is available for a cost of $9/hour. At the Oceaneer’s Lab and Club, you sign your kids in and then they stay there until you sign them out. They also have phones in your stateroom that you each can keep so that you can contact your kids on the ship if they are in the kid’s clubs. If they would like to leave, then they can easily contact you themselves with the phones. At the pre-teen and teen kid’s clubs, the kids can come and go as they please. The cast members also take them on outings throughout the ship where they will get the opportunity to see some of the behind the scenes stuff that no one else gets to see. Although you are on a family vacation, I usually hear that a lot of parents rarely see their kids because they love the kid’s clubs so much. The Oceaneer’s Lab and Club are super cool. We got to tour it on the first day during open house, and there is something for everyone. They play games, do crafts, animation, have scavenger hunts, or just general free play. You walk in to the kid’s clubs and it feels like every kid’s dream come true! With everything mentioned above, it does come at a price. The cost is comparable to what you would pay for a week to stay at a deluxe level hotel at Disney World. We stayed in an ocean view stateroom with 3 adults and 1 child, and the rate for that was approximately $4,100 USD. The main difference between Disney Cruise and Disney World is that you get all your food included, so it is a bit more all-inclusive. Besides that, you don’t really have to spend anything extra unless you want to. If you’d like a spa treatment, or to eat at one of their specialty dining places, then that is extra. But again, neither is necessary to enjoy your cruise, so it really is an extra if you want. Everything you need is included and you will still have an amazing time. Disney Cruises do cost more than other cruise lines, but I can definitely see why. If you ask me if it’s worth it, I would say yes, hands down! You get what you pay for, and the quality is just top notch. Not to mention, you still get that Disney vacation while being able to relax on a beautiful cruise. The cast members are just the best and if you’ve ever been to Disney World, then you already know how well Disney cast members are trained. This truly transcends in to the Disney Cruises and I find they even excel more in this area. 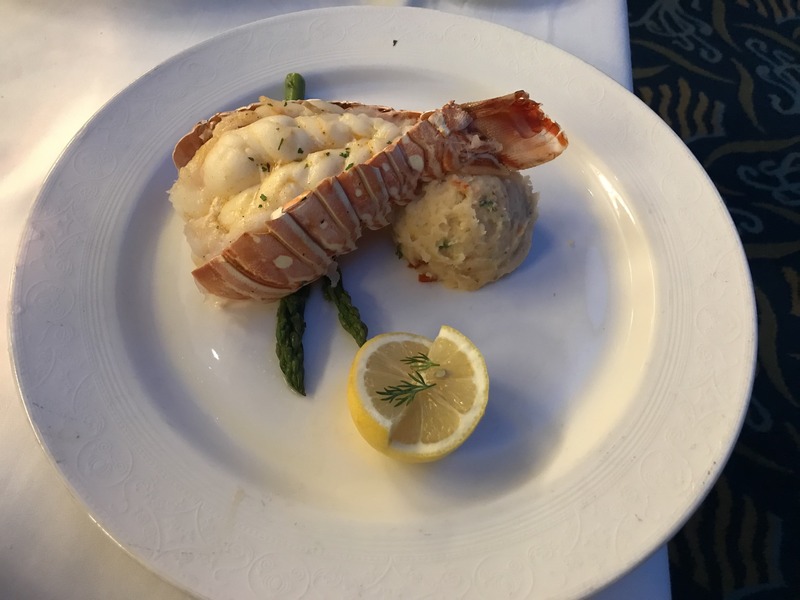 Even though we were on this ship with over 2000 other passengers, they still found a way to provide excellent service while making us feel special. You get that magical Disney feeling that you just won’t find on any other cruise line. I noticed that many of the passengers onboard were repeat Disney cruisers. In fact, I think there were more repeat cruisers than first-time cruisers, and I think that speaks volumes as to how much people enjoy these vacations when they keep coming back. One thing is for sure, is that we will definitely be doing this again! PreviousPrevious post:Understanding the Different Types of Disney World Park TicketsNextNext post:FREE DINING is Available Now for Booking!